Friends, the holiday season is upon us and I’m so excited to offer up this easy plant-based dessert everyone will love and no one will suspect is dairy- or gluten-free. Let’s do this! 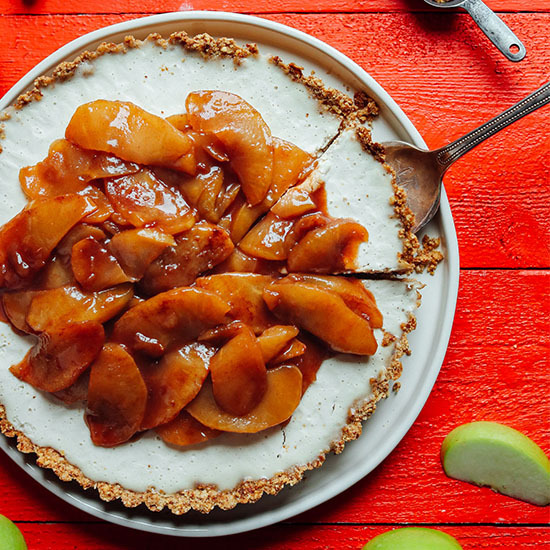 The crust for this gorgeous 10-ingredient tart is a blend of rolled oats and almonds naturally sweetened with a hint of coconut sugar and maple syrup. 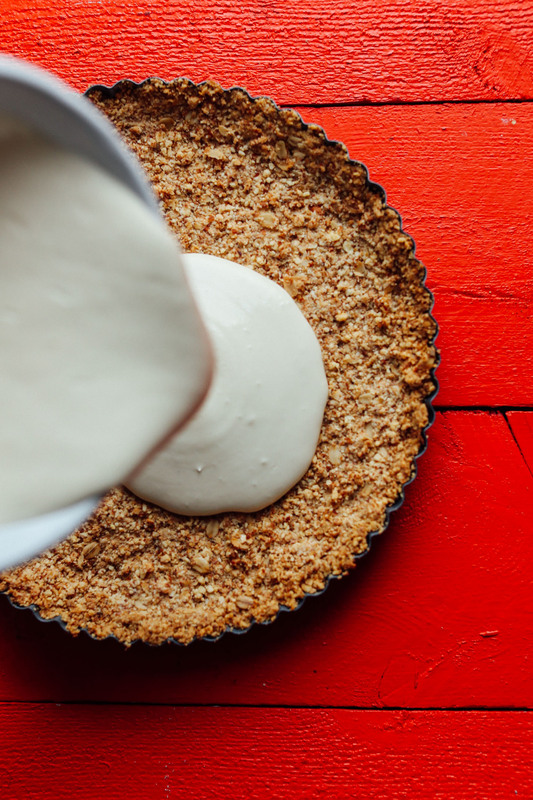 Coconut oil adds moisture and allows the tart to crisp up in the oven beautifully. Next is the filling, which is a simple blend of ingredients like coconut yogurt, soaked cashews, maple syrup, and lemon. The filling is poured over the baked (and cooled) crust and cooled as we work on the topping! For a topping, I put my Cinnamon Baked Apples to good use. They’re naturally sweetened, require 1 bowl, and come together quickly while the tart chills. 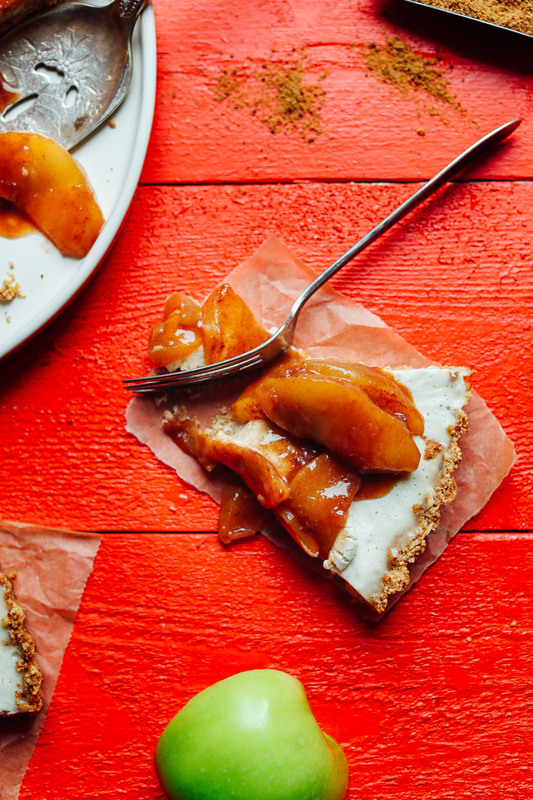 And before you know it, you have a gorgeous fall dessert on your hands that’s perfect for just about any occasion. This would make thee perfect dessert as we move into the holiday season. No one will guess it’s dairy- or gluten-free. It’s incredibly rich and satisfying, and you can top it with virtually any fruit you have on hand. 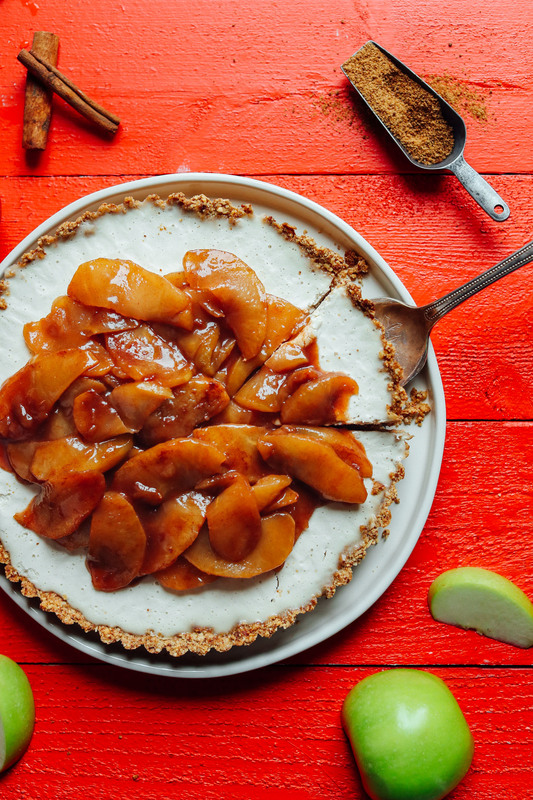 For more easy holiday dessert ideas, check out our 1-Bowl Apple Gingerbread Cake, World’s Easiest Vegan Cinnamon Rolls, Apple Pie Crumble Bars, Vegan Gluten-Free Pumpkin Pie, Mini Vegan Pumpkin Pies, Pumpkin Pie Parfaits, and Fluffy 1-Bowl Vegan GF Sugar Cookies! If you try this recipe, let us know! Leave a comment, rate it, and don’t forget to tag a photo #minimalistbaker on Instagram so we can see your beautiful tarts in real life. Cheers, friends! 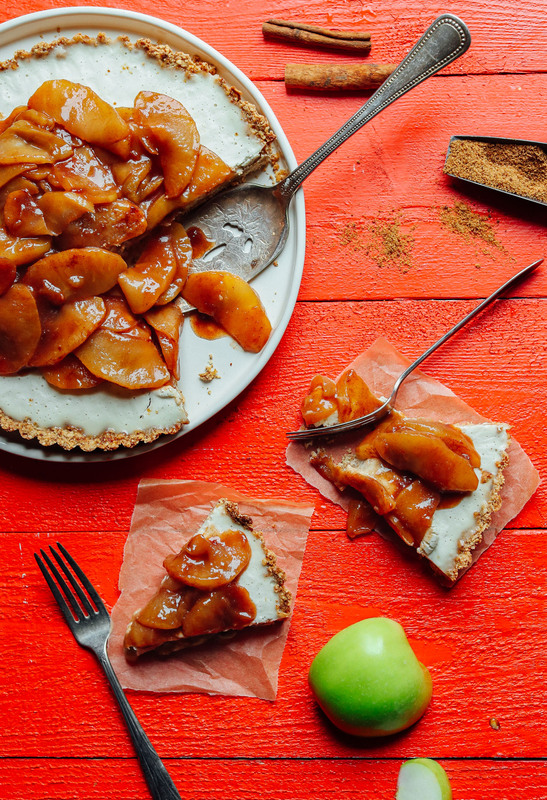 An amazing 10-ingredient Vegan Cheesecake Tart with an oat-almond crust, creamy cashew-coconut center, and caramelized apples! The perfect easy, gluten-free, and naturally sweetened holiday dessert. Start by making preparations for filling. If making coconut yogurt, do so first. Otherwise, proceed with store-bought or sub coconut milk or cream (see note in instructions about extra lemon juice). Next, soak your cashews in very hot water for 1 hour or 6-8 hours in cool water. Then drain and set aside. If using soaked cashews more than 1 hour after draining, cover and refrigerate for up to 4-5 hours (continuing the soak can make them mealy or too soft). Meanwhile, prepare crust by preheating oven to 350 degrees F (176 C) and adding oats, almonds, sea salt, coconut sugar and maple syrup to a high-speed blender or food processor. Pulse into a fine meal. Then add coconut oil and and pulse until a crust "dough" forms that holds together when you squeeze it between your fingers. If it appears too dry, add more melted coconut oil 1 Tbsp (15 g) at at time and blend. I found 5 Tbsp (75 g // as recipe is written // adjust if altering batch size) to be about right. Line a 9-inch tart pan with a removable bottom (or sub a pie pan or 8x8-inch baking dish) with parchment paper. I did this by cutting out a circle that fit in the bottom of the pan and just reached the edges (if using an 8x8 dish, extend parchment paper up over the edges). Then add the crust mixture to the pan and use your hands to spread it into an even layer, pushing the crust up to the edges of the pan so it contains the filling well. To achieve a uniform layer, cover a flat-bottom object (such as a drinking glass) with parchment paper and press down firmly. Bake for 15 minutes. Then increase heat to 375 F (190 C) and bake for 5-8 minutes more or until the edges are golden brown and there is some browning on the surface. Remove from oven to cool for 5 minutes. Then carefully transfer to the freezer to chill. Make filling by adding coconut yogurt, soaked and drained cashews, the lesser amount of maple syrup (2 Tbsp (30 ml) as recipe is written), lemon juice, melted coconut oil, vanilla (optional), and sea salt. Blend on high until creamy and smooth. Then taste and adjust flavors as needed, adding more lemon for acidity, maple syrup for sweetness, or vanilla for intense vanilla flavor. Remove cooled crust from the freezer and pour the filling onto it. Gently tap a few times to release any air bubbles. Then set back in the freezer (I set mine on a baking sheet to keep it flat) and freeze until firm to the touch - about 2-3 hours. While this happens, prepare desired fruit topping. I went with a half batch (3-4 apples instead of 6-7 // as recipe is written // adjust if altering batch size) Cinnamon Baked Apples, but fresh fruit would also be lovely here. 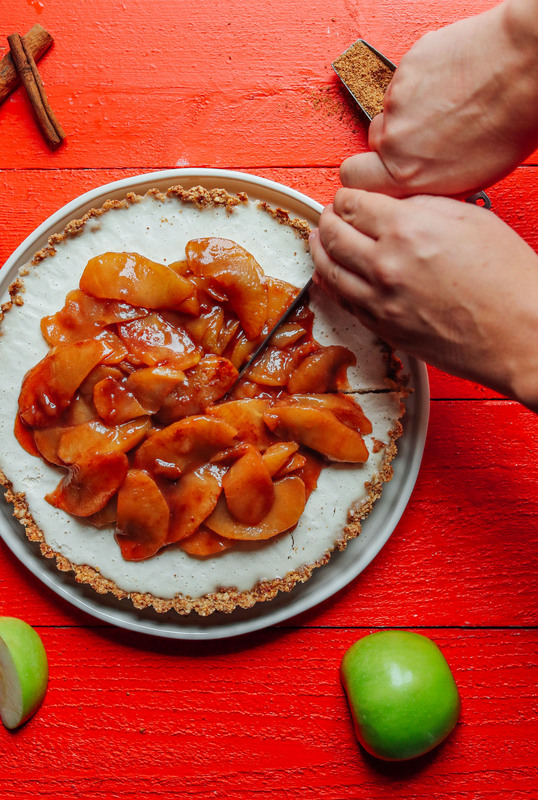 The important thing to remember is the apples (or any baked fruit) need to be cooled completely before being added to the top of the tart or it will melt. To serve, make sure the tart has set out for at least 1 hour from the freezer so the filling is more the consistency of cheesecake. Store leftovers covered in the refrigerator (freezing isn't necessary) for up to 4 days. *Loosely adapted from my Easy Baked Vegan Cheesecake. *Nutrition information is a rough estimate calculated with all ingredients listed, including 1/2 batch of Cinnamon Baked Apples. I really love your recipes and cooking ideas! I’ve renewed my interest in cooking – and cooking healthfully – since I found your website. Please keep up with your innovative cooking / baking tips and recipes! I just made this and it’s super yummy! My crust came out very thick, though, so it was hard to get through with a fork. Next time I’ll try reducing the crust a bit, and maybe increasing the filling so it’s still nice and full. I’ll also make sure to grind the crust more finely next time. Hopefully I’ll get a more delicate texture that way. Hello! This looks absolutely delicious and I really want to make it for my family pre-Christmas lunch. What can I sub for the oats in the crust? My partner is coeliac and has a bad reaction to oats. Thankyou! Help! I made this before and LOVED it, so want to make it for my work Christmas party this weekend, but the link to the baked cinnamon apples is broken!! Please help me get that portion of the recipe… thank you! It should be back and working, Catherine! Just made this for a Canadian Thanksgiving dinner, if making the baked apple topping, I recommend using a lot less arrowroot. I halved the recipe and followed exactly, and the apples were fantastic when warm, but when they cool down to put on the cake, the caramel sauce becomes VERY gelatinous from the arrowroot. Other than the gross texture of the apples, the flavours were amazing! Good tip, Stephanie + Happy Canadian Thanksgiving! Tonight was my second time making this! I like to swap the apples for blackberries that I simmer on the stove with a little added water and coconut sugar. SO DELISH! I like recipes that make my non-vegan friends understand how delicious it is to be a veggie head! This will definitely be a recipe I use for a lifetime!! Yum! Blackberries would be absolutely delicious here! SERIOUSLY AMAZING. I made this with a berry topping for our New Years Eve dinner for 15 people (non of whom are vegan). They could not stop talking about how delicious it was!! I won the best dessert of 2017! Addicted to your recipes. Yay! So glad to hear, Bianca! I made this using coconut mil with lemon and it was delicious. I put raspberries on top, because I live in Chile and are in season. I made this for the holiday and loved it! Will definitely make again. Also, I used the full batch of apples instead of the half and it was great. Thank you, Dana! The last time I had an apple-oriented dessert was this vegan apple pie from Costco. Yes, it was accidentally vegan! Woot woot! I adore vegan cheesecakes though–I bet this baby was such a winner! I made this cheesecake for Thanksgiving and it turned out soooo good. Not to mention the house smelled wonderful. Thanks for all the delicious recipes. made this for thanksgiving and everyone loved it!! I made a biscoff lotus salted pretzel almond oat base with melted vegan butter instead (bc I wanted to use the biscuits off ?) and also accidentally forgot to halve the rest of the recipe when I did so for the fruit but managed to save save it by adding frozen blueberries and more lemon juice. it was still sweet but having only slightly sweetened coconut whip made it all the perfect! Not to mention, this was served rather soft as there was only room in the fridge and not the freezer. Goes to show that the flavour was bomb diggity! Five stars! I took this to Thanksgiving dinner last night, along with three other pies (one vegan and two traditional) and this tied with the (dairy) French-style tarte aux pommes as the crowd favorite. I might make the filling just a touch sweeter next time to better approximate a classic cheesecake, but this is by far the best plant-based cheesecake I have ever tried. Thank you! Made this for Thanksgiving, and it was so delicious in every way–taste, texture, and conscience-wise! Even my partner, who’s a total dairy fan, loved it. I used the apples, and I think next time will try something with raspberries. Thanks for this great recipe, fellow Fizzlers! Aw, thanks Maria! So glad you liked it. Hi! I just wanted to thank you so very, very much for this recipe! I made it last night and served it at Thanksgiving so I could have a dessert to eat ( I’m lactose intolerant and have IBS with gluten sensitivity). I absolutely LOVED IT! It tasted like cheesecake! I topped it with fruit and it was so good! I appreciate your blog so much, I love your recipes and it’s so nice having a vegan blog with consistently delicious recipes. I didn’ t have enough cashews, so I subbed hemp hearts as I read suggested by commenters, and it worked out quite well. I am so grateful, you made my day! Happy Thanksgiving!! I am new to your site and a college baker! I wanted to make a vegan dessert for our thanksgiving dinner. It had to be approved by not only those who were gluten free and vegan, but by my grandmother. Her favorite slogan, when it comes to baking is, “If you don’t like butter, use cream.” I am pleased to say this recipe impressed even her. I added a bit more syrup, lemon, and vanilla to make the cashew taste more moderate. It was a great recipe! Thank you! So kind – thanks Mikaela! Dana, thank you! This is heavenly delicious! I think I’ve never had a dessert better than this. Where can I find a gluten free product to make the base? I understand that oats have gluten, is this not so? You can buy gluten-free oats. The package will say if it’s GF or not. If I prepare the tart before thanksgiving (ex: make the tart on 24th, and serve on 25th) how do I store the tart? All my non vegan coworkers loved this, they couldn’t believe the ingredients. They said it was phenomenal. Would definitely make again. I sent a picture of this thru instragam but you didn’t open it. Understandable. Made this last night and I was wonderful! It did take a while to make, but it was fun. 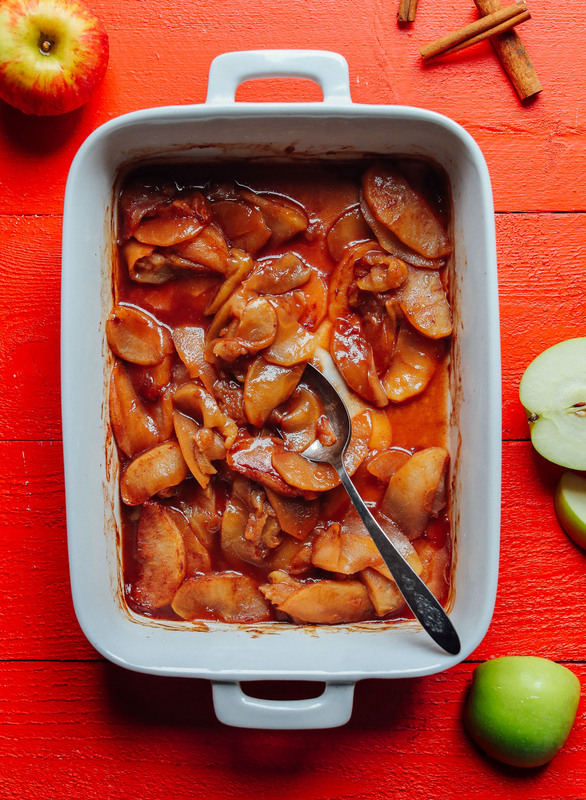 I ended up making the cinnamon baked apples with it, and everything tasted so good together. The crust was also incredible. Will be making this again! I haven’t found an almond milk that I like. I would sub coconut cream instead! Any idea how far in advance I could make this? Hoping to have it ready for thanksgiving but have it done early so I don’t have too much to do the day before. Can’t wait to make it, it looks wonderful! I’m thinking up to 3 days! Holy Hannah! This looks insanely good. I suggested macadamia nuts or hemp seeds! Hemp seeds don’t need to be soaked, FYI. Sunflower seeds will work very well for the crust. For the filling, I feel that it would be best to create a combination of seeds such as pumpkin, sunflower, hemp and even maybe some unsweetened shredded coconut. Soaking your seeds will help to soften them. Follow the instructions for that process. Thank you for this beautiful tart. I have an allergy (hives) to tree nuts. Amy suggestions as to how to make it without the nuts? Perhaps sub all oats in the crust, and try subbing hemp seeds for the cashews? What is the role of the parchment paper? It isn’t absolutely necessary. But it helps the tart lift easily out of the tin! So excited!! THANK YOU Dana! This looks wonderful and I can’t wait to try it. How well do you think it would freeze? Any tips? I’m concerned that the filling might not handle the freezer. It would freeze well! Just make sure you thaw it for 1 hour before serving. I love your site and recipes. You provide a lot of guidance and hope to those of us who desire to eat healthier. Thank you, and Happy Thanksgiving! This looks so freaking delicious! !